Oh man. I think I’m in a bit of a carb como after all the Super Bowl shenanigans last night. Why do I always go overboard?! Eeeeesh. I’m moving a little slow today, but I hope you’re feeling bright eyed and bushy tailed this morning–ready to take on a fresh week! 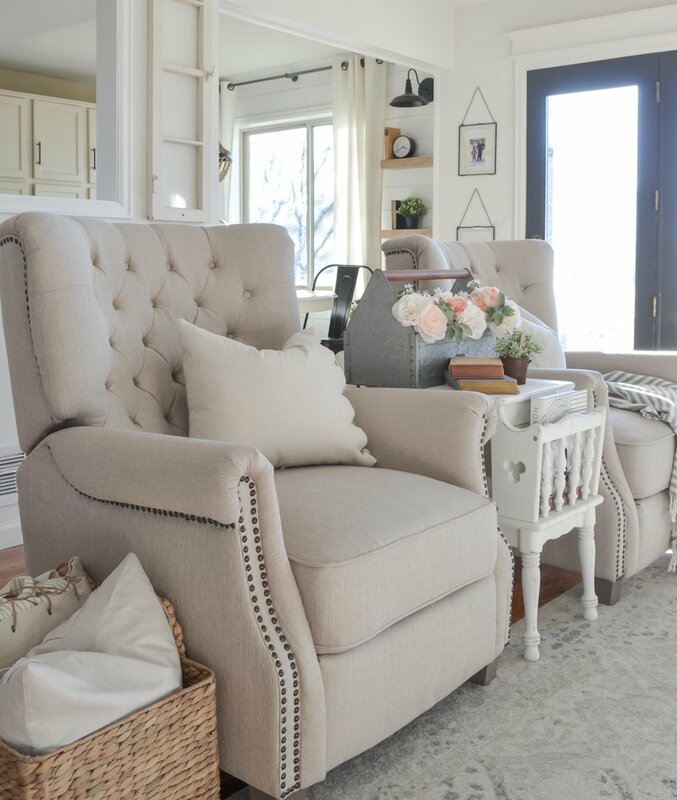 Today I’m excited to share a full review of our Walmart recliners. 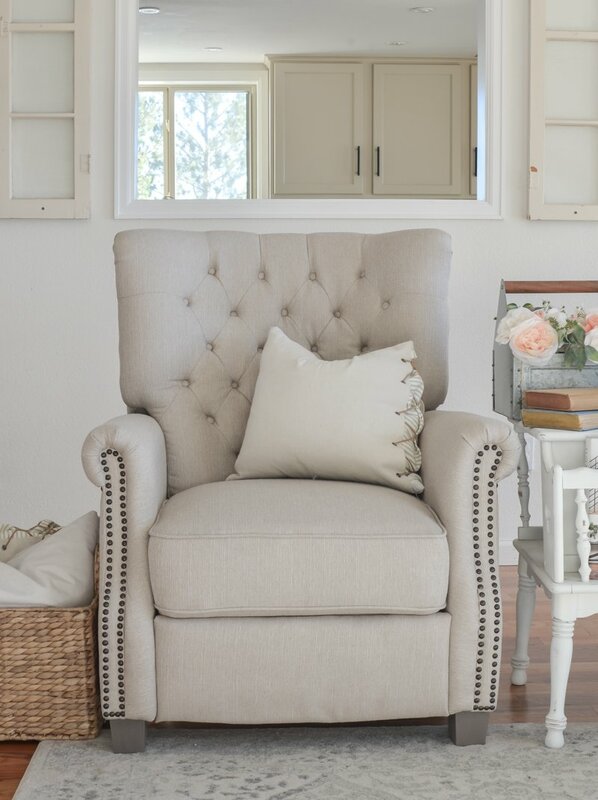 We bought a pair of these chairs in the color beige in December and every single day since then I’ve received emails and DMs with questions about them! And I totally understand why. 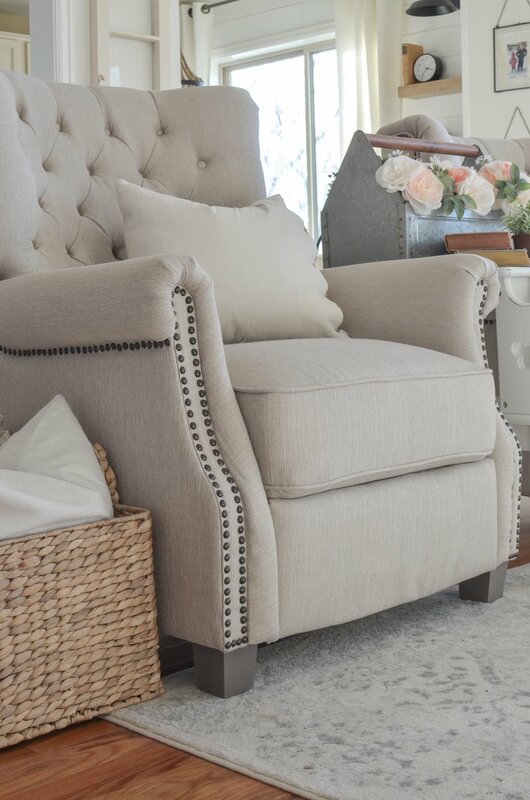 Finding a good looking recliner that doesn’t break the bank is TOUGH business. 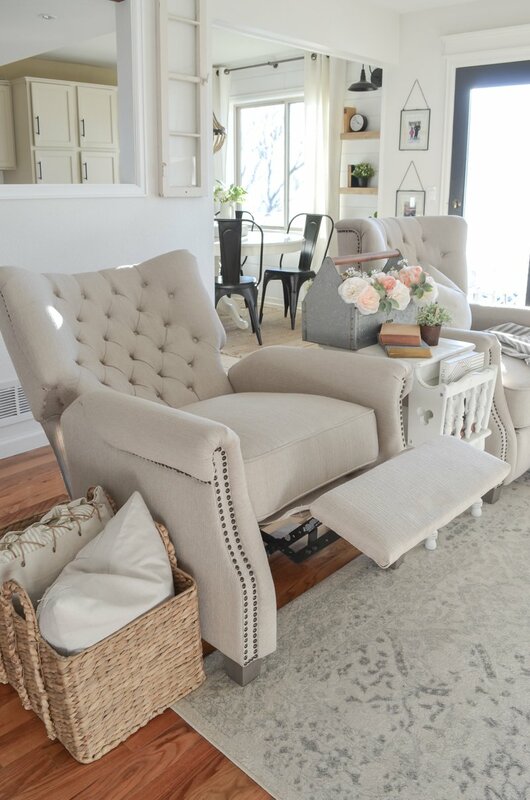 My husband kept begging me to switch out our old chairs for recliners, but I never could find any I loved that didn’t also cost a ton of money. So when I stumbled on these from Walmart I was instantly in love. 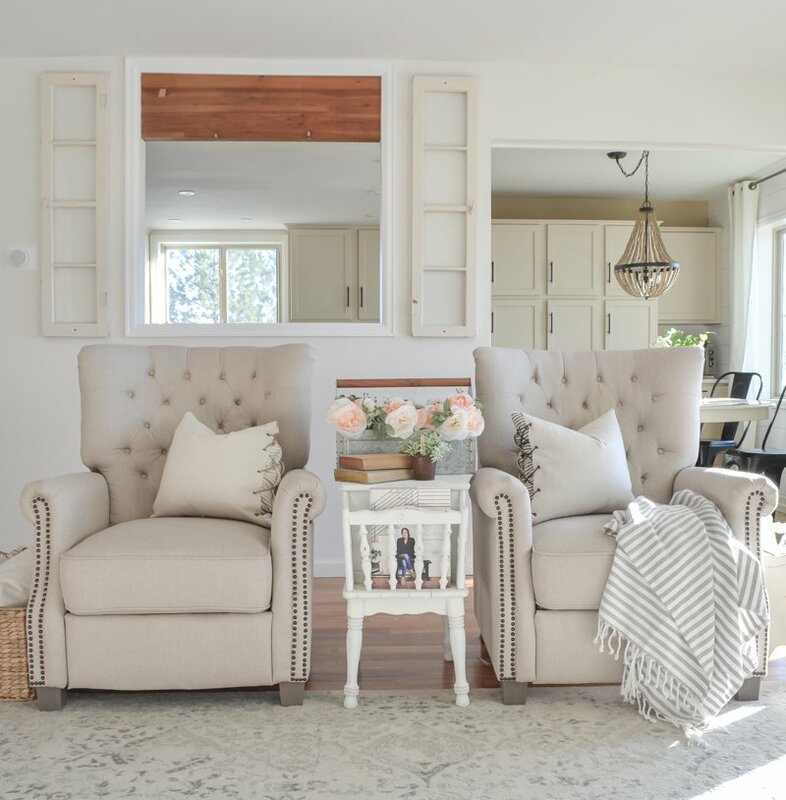 They met everything on our wish list: 1) good looking and matches our style 2) larger than most similar recliners on the market 3) very affordable. It was a magic combo! We’ve been using them every day for almost two months now, so I figured that was enough time to share a review and answer the most popular questions I’ve had about these recliners. Do you have to put them together? Yes, each recliner comes in a large box and there are two separate pieces we had to put together. But it was super easy and only took about 15 minutes per chair. Do they rock or swivel? Nope, there is no rocking or swiveling with these chairs. Yes! That was something we were really concerned about with buying them online and not trying them out first–especially given the price. But I’ve been pleasantly surprised. They don’t feel flimsy or cheap at all. You would never guess when you sit in these or see them in person that they were only $200. 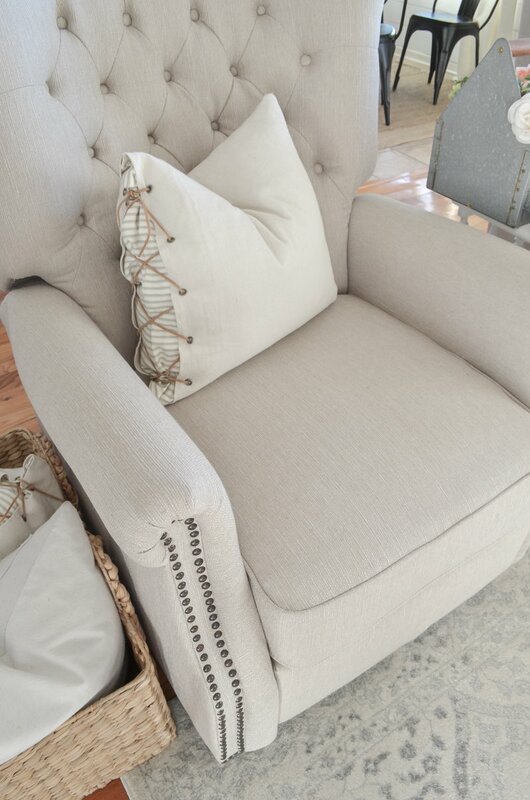 My lace up pillows are from The Vintage Songbird shop. Does the fabric stain easily? We haven’t had any major accidents on these chairs yet (thank goodness!) but there have been smudges of chocolate and a few other random things like juice spills. I can say these chairs spot clean easily with a hot soapy rag. They’re definitely better than my white Ikea sofas, which show dirt and stains super easily. Did we use anything like Scotch Guard on them? No we didn’t and I don’t think it’s necessary. I think they’ve already been treated with something to protect the fabric. This one is kinda tricky to answer because I think we all have different definitions of what’s stiff or soft when it comes to furniture. But in my opinion these are not stiff at all. They are firm, but not too hard if that makes sense. The cushion definitely gives when you sit on it and it’s even a little bouncy. How far back do they recline? They go back so far that you’re laying almost flat when they are fully reclined. You can also recline them only partially out, so that your legs are out but the back is up straight–that’s how I use them out of the time. Are they a good recliner for a large man? My husband is 5’11, 200 pounds and he loves these recliners. There is plenty of room for a larger man. They’re actually the same size of the chairs we used to have in our living room. Yes! After using them every single day for two months I can honestly say they are comfortable. I’m actually sitting in one right now to type of this post! They’re great reclined and great as a normal chair too. The only issue I’ve had is that when I’m fully reclined there is no head support. As you can see on the back of the chair, there is no extra padding for a head pillow which you sometimes see with recliners. So I prefer to just put a small pillow under my head when I’m fully reclined because I feel a little more comfortable that way. That’s honestly the only complaint I have about these chairs. 100% YES. I even told my husband that I’d buy these new every few years if we needed to. Obviously we’ve only had them two months, so I can’t say yet how they’ll hold up over years of use, but even if we had to re-purchase them every other year I would do it just because they’re so darn affordable. You can by five of these chairs for what the average recliner costs from somewhere like Pottery Barn. Is the cushion cover on the seat removeable and washable? Where did you get the blush flowers in the toolbox??? Hi Wendy, those are from Michaels. Could you please address how easy/difficult it is to make them recline. Is there a lever or do you just push on the arms? Is it difficult to closed the leg part when getting up? such a good question and I should have addressed that. There is no lever, so you do have to push back to recline these chairs. I find it to be pretty easy, but if you have any back issues it might be more challenging. And it’s not difficult to close the legs. In fact, I think it’s easier than most recliners I’ve sat in. I have the same question as Diania about how easy is to recline. Is there a leaver or do you use your arms. Love, love your blog. Can’t wait to hear from you. that’s a great question! There is no lever, so you have to push back to recline the chairs. It’s pretty easy, but if you have back issues it could be more challenging. Sorry I didn’t add these questions to my previous post. 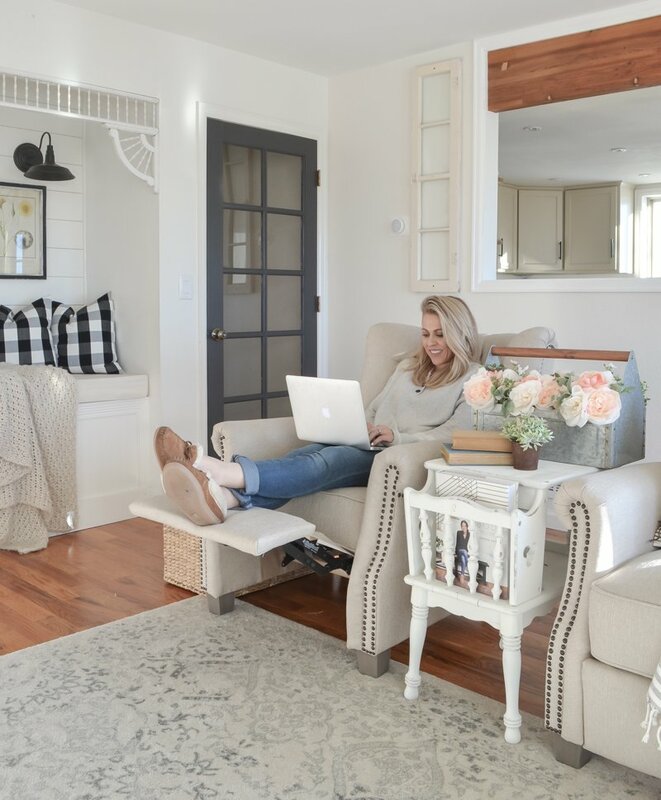 I have 2 questions about your blog on the floating shelves in the Breakfast Nook post. Your lighting fixture is it hot wired or battery and where can I find it and the Bakery sign. HI Martha, that light is actually just a faux light about the shelves. It’s not hard wired! We had a puck light in there for a bit, but I took it out bc we never used it. And the Bakery sign was just a random find at a local boutique! It’s just a reproduction, so you might be able to find one online somewhere. Thanks so much for the amazing review!!! One question… Do you have a cat, one that still has their toenails? Some fabrics aren’t kitty friendly and snag 😢 Thanks so much and have a blessed day! I don’t have a cat, but I could see these chairs possibly snagging kitty toenails. The fabric is not smooth like my Ikea sofas, it has more texture. Oh i’m right there with you Melissa, I’m all about ticking stripe! First I want to say how much I love and appreciate you sharing your home with all of us. You have such a talent for displaying your furniture and accessories. Love Love Love your entire home! My questions I have for you. First your end table with magazine rack between the two new rockers. May I ask where did you purchase the table. Also I am trying to do a make over in my family room and want to buy slip covers for my couch. Could you recommend a company that has a nice selection with a good quality material and good price. I would appreciate any advise you could give me. And also I have a blank wall behind my couch with nothing on it. 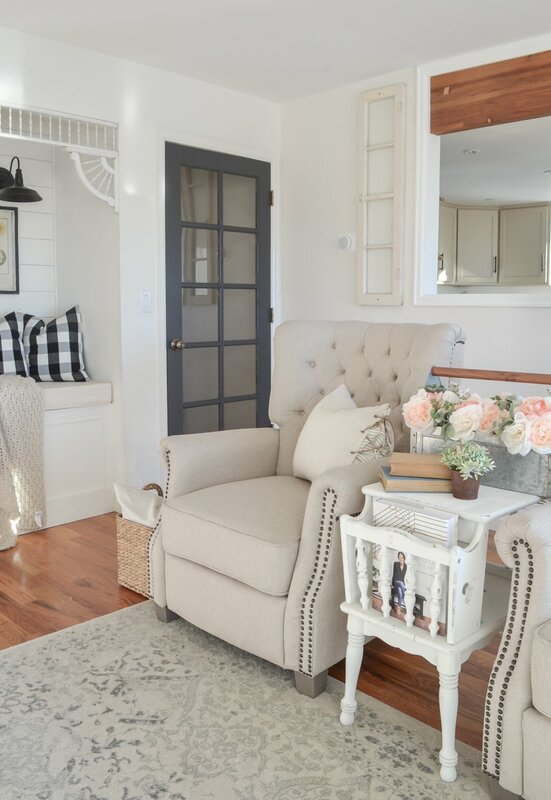 What would be your advise on something large to go behind the couch..I do not want a mirror, thinking of the country/shabby farmhouse look!!! Thank you so much and look forward to hearing from you. I have a rocker recliner that my Dad bought me for my first baby (she is 32). I used it a lot with all 4 of my now grown up babies and puppies ! I have had it recovered twice over the years … but the mechanism inside is still 100 %. So sometimes a little more expensive chair can also be a good investment 👍. Yes, that’s a very good point Mary. And I’m all about investing in expensive furniture when we can afford to! I just shared this with my son and wife and they love them. They definitely are cuter then most recliners. And so affordable!! Aren’t they so cute Faith? I’m so happy I stumbled on them. You may have mentioned this is an earlier post, but what color did you use on the door? It looks like a dark gray. It’s actually black–it’s called Wrought Iron by Benjamin Moore. 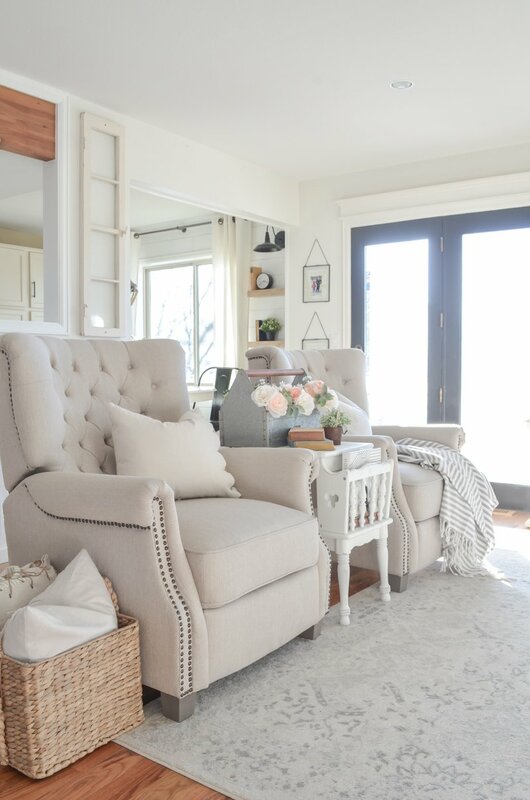 Love these chairs, Sarah! Just curious, what did you end up doing with your old chairs? I liked those ones, too! Hi Marly, we actually gave them away to family! Thank you for the post I’m looking for some recliners for our bedroom when we redo it. I have a loveseat recliner now and am thinking of going to two recliners instead. I’d probably get the grey ones as I’m going with a grey ton in our room. Is the chair color more beige or cream? I have anew grey walls and wonder if they would coordinate ? Two questions. First, do they come with arm covers? Second, this may be hard to answer but I am debating about which color to order. It is so hard to tell online exactly what the color will look like. I love the cream in your photos but it looks a little more yellowish cream and brighter on the Walmart site. I have a darker taupe/grey couch and loveseat and a brown leather recliner. I don’t want it to be too stark against those but greys can be tricky so that scares me a bit too. Any insights you can share on the color would be appreciated! Thanks so much for the review! Great review! The website doesn’t state the height of seat, can you measure from the floor to the seat cushion? Just wondering if the seat is a good fit for taller people and need the seat height. Thanks! That was a great review of the chairs. I wish I had space for one because they really are pretty. You may have shared this before but where are the pillows with the laces from? I love this space. Thanks for sharing. Love these chairs! Where did you get the light fixtures that are in your nook? Thank you for the review. I’m considering buying these chairs in the near future. Can you tell me how far off the ground the seat cushion sits? I can not find that measurement on the site anywhere. My father in law is about 6’2 and we are needing to find him a chair that is sturdy that has arms and reclines that he does not have to bend real far down to get seated. If you could maybe also tell me the height from the floor to the top of the arm rest. Love the chairs, they look great in your room. Sarah, they are so pretty, and I never would have guessed they were from Walmart!! Super cool!!! Curious, would the chairs match or blend with your IKEA sofa? What color is your ikea sofa? Yes they definitely would go well together. The IKEA sofa is white. I just started following your blog, so inspiring! Just want to say we purchased the same recliner last October and have loved it! So convenient that it arrived on our doorstep in less than a week and very easy to assemble. I bought one based on your reviews. 🙂 I do like mine as well. I bought the gray one. It’s cheaper too. I love the color. It’s a very light gray that goes well with my farmhouse decor. Thanks for the info! Thanks so much for the information on these chairs it was so helpful.